First it was Roger Federer. Then it was Rafael Nadal. And the hits have kept coming at the Miami Open. Federer withdrew from the tournament due to illness, while Nadal could not get through his first match because of issues related to the heat. David Ferrer followed his fellow Spaniard out of South Beach by losing to Lucas Pouille on Sunday night. On the women’s side, Serena Williams and Agnieszka Radwanska both lost on Monday afternoon. The carnage continued when Andy Murray succumbed to Grigor Dimitrov 6-7(1), 6-4, 6-3 during third-round action. Dimitrov trailed 3-1 in the final set but reeled off five straight games to wrap up the victory in impressive style after two hours and 25 minutes. It was a much-needed result–and one of his best ever–for the Bulgarian, who currently registers 20 spots off his career-high ranking at 28th in the world. He had not defeated a top-10 opponent since upsetting then-No. 9 Stan Wawrinka at the Monte-Carlo Masters last spring. This is Dimitrov’s second-even win at the expense of a top-2 opponent, having previously stunned world No. 1 Novak Djokovic on the clay courts of Madrid in 2013. “I’m happy,” Dimitrov assured. “Of course I’m happy with that victory. Every time you beat a top player you know you must have done something good. Murray played a near-flawless first-set tiebreaker, but he struggled in the pressure-packed moments throughout the duration of the proceedings. After trailing 4-0 in the second set, he had a break point to get back on level terms at 5-5 but could not convert. The Scot also dropped his last three service games of the match without even getting to deuce a single time. 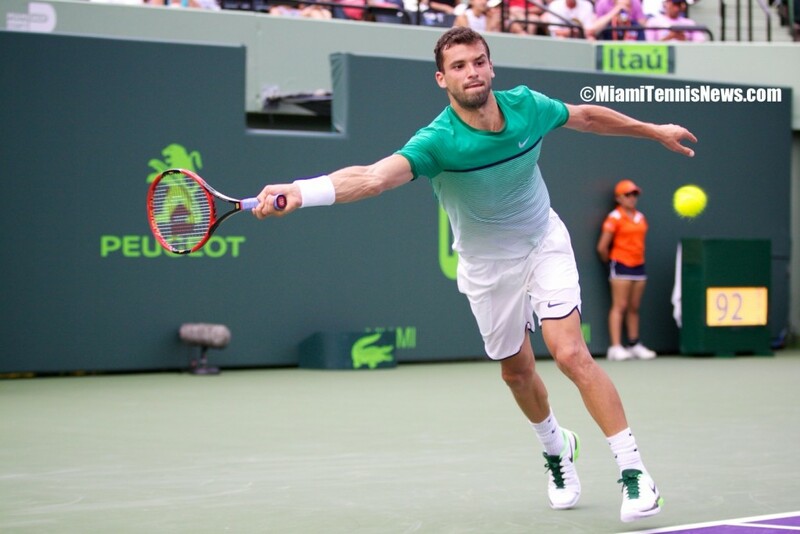 Dimitrov will have to be ready for another physical battle against Gael Monfils on Tuesday. Monfils has enjoyed a much more routine trek through the Miami draw, having disposed of Tatsuma Ito and Pablo Cuevas in easy straight sets. Dimitrov, on the other hand, preceded his triumph over Murray by outlasting Federico Delbonis 7-6(8), 4-6, 6-4 in two hours and 39 minutes. Joining Dimitrov and Monfils in the last 16 were Nick Kyrgios, Kei Nishikori, Roberto Bautista Agut, and Andrey Kuznetsov. 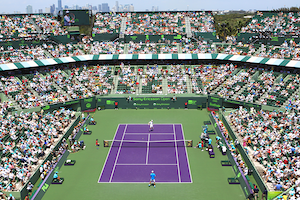 Order was restored to the Miami Open on Sunday, when scorching conditions relinquished at least a small part of their grip on Crandon Park Tennis center. Three retirements in the men’s singles draw had taken place amidst brutal heat on Saturday, which was not what the tournament needed 24 hours after Roger Federer withdrew due to illness. But no early stoppages plagued the field on Sunday as third-round action got underway. Novak Djokovic’s only real trouble came in the form of a nasty fall during his first set against Joao Sousa. The world No. 1 also dropped serve twice in the opener, but he eventually picked up the pace and cruised to a 6-4, 6-1 victory. It was a positively dominant one in set two. Djokovic surrendered a mere three points in three service games while breaking Sousa on three occasions. Sousa won just 10 points in the entire set before bowing out after one hour and 17 minutes. Four of the eight men’s matches on Sunday took long, circuitous routes to finish. A quartet of contests went the three-set distance and each of those four lasted more than two and half hours. Tomas Berdych and Steve Johnson began the day on stadium court and the Czech needed two hours and 43 minutes to hold off the American 6-3, 6-7(6), 6-3. On the Grandstand, lucky loser Horacio Zeballos saved one match point before upsetting Fernando Verdasco 1-6, 6-4, 7-6(4) in two hours and 34 minutes. Following a Richard Gasquet rout of Benoit Paire in between, Gilles Simon outlasted Marin Cilic 6-3, 6-7(4), 6-3 in two hours and 46 minutes. It was the sixth time in as many head-to-head meetings that Simon and Cilic went to a final set. Arguably the best was saved for last, as the nightcap in the stadium saw David Ferrer and Lucas Pouille battle to just a few minutes shy of 12:00 a.m. After two hours and 45 minutes of a roller-coaster affair, Pouille pulled off a 6-7(1), 7-6(5), 7-5 upset. The Frenchman held serve at 6-5 in the third from 15-40 down to clinch the biggest win of his career. 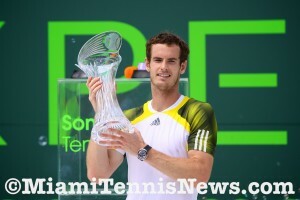 Britain’s Andy Murray had more at stake today than the Miami title. Hoisting the Sony Open trophy would signify the number two world ranking. 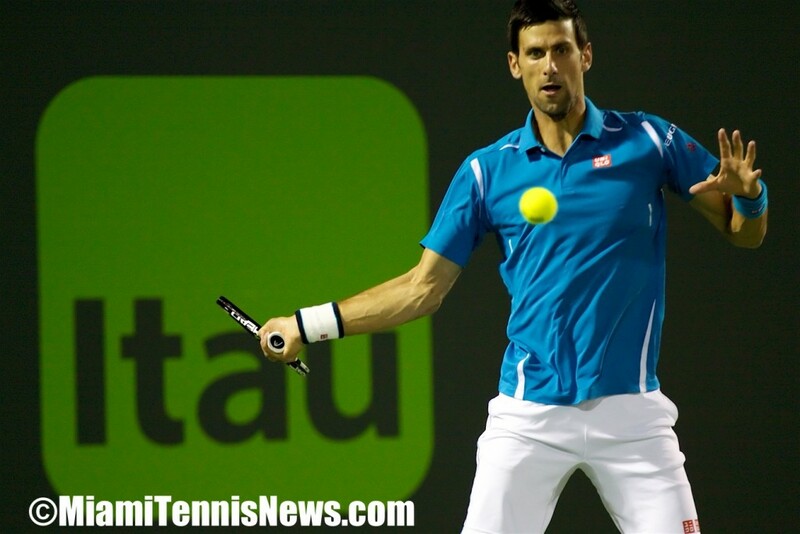 The reigning U.S. Open defeated Spaniard David Ferrer 2-6, 6-4, 7-6 to obtain his second Sony Open prize. Ferrer, who was making his maiden appearance in the final in Miami, his fifth at the ATP Masters 1000 level, knew from the outset it would be an uphill battle. Ferrer’s first ATP Masters 1000 title came in November after being denied three times prior. Although Murray had a slight 6-5 lead in their head to head, the Spaniard has just one win on hardcourt. The others have been on clay. In 2011, these two collided at the Masters tournament in Shanghai, Murray triumphed in two sets. Moreover, history was not on Ferrer’s side. Three compatriots, including Rafael Nadal three times, have gone down in the final at the Miami Masters. Also, Ferrer has an abysmal mark against top five players, 0-12. Nevertheless, this was far from the Spaniard’s mind as he salvaged two break points in his opening service game, then went on a five game run to lead 5-0 in the first set. On Sunday, in the Sony Open final, Andy Murray will take on David Ferrer. Murray beat Richard Gasquet 6-7, 6-1, 6-2 to advance to his third final in Miami. Gasquet befuddled the 2009 champion early on, getting the break with a beautiful back down the line winner. The Frenchman went on to consolidate and move ahead 3-0.